I tell people all the time that the Law Of Attraction works in mysterious ways, attracting the positive things you need just when you need them. This photo was taken by David Conroy, The Lone Drainer And Pronto!, Sydney’s Premier Plumber – it’s not my vehicle, but the plate might as well be! The incredible thing about what we do is transform people’s thinking from ordinary to exponential. When that happens – FUN STUFF like this erupts. Stay tuned for more blog posts, events and yes of course – BONUSES!!! 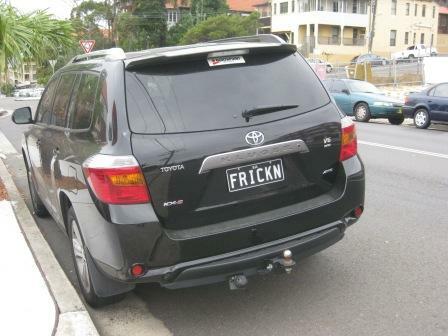 I agree – if that ain’t your car it FRICKN should be. I can see another web site with that word. Great find David!